The first tank in Blitz to feature its own special Camouflage. Also has additional aesthetic logs, helmets, etc. added to the tank model. Decent frontal armor is on-par with the M4A3E8. 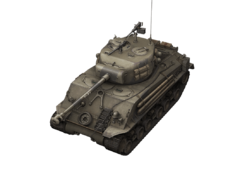 Traverse speed is better than its Tier 6 brother, but otherwise performs exactly like the M4A3E8 in combat. Play this tank exactly as you would the regular Sherman. This page was last modified on 15 July 2016, at 16:32.